Two slot fence splicing tool. For quick, trouble-free splices. 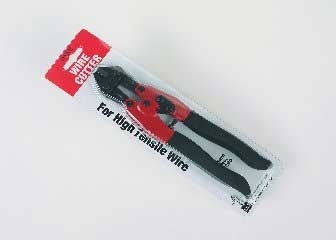 Use with 2-3 and 3-4 Splice Sleeves, DOT 3-4 Fence Taps. May be ordered individually or 5 each per shipper. Cushion handle. Staple puller, wire splicer, pincer, cutter and hammer all in one tool. Drop forged steel. 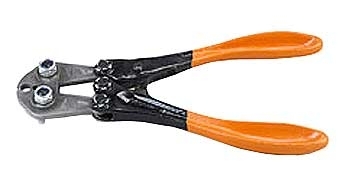 Wire cutter, specially hardened jaws designed to cut 12 1/2 gauge high tensile wire. Pocket size, 9 in. overall length, imported. Install in fence line to periodically renew tension. 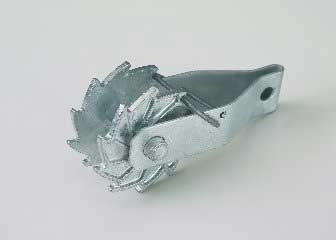 Heavy cast round cog with spring loaded latch. Hot dip zinc coated frame exceeds type III specifications. No raw uncoated steel edges.